My husband loves birthdays! I had never really put much stock into my own birthday before him. It was just another day. He loves them so much, though, that it is infectious. He’s so full of energy and excitement for birthdays, so we like to have fun with our birthday week. 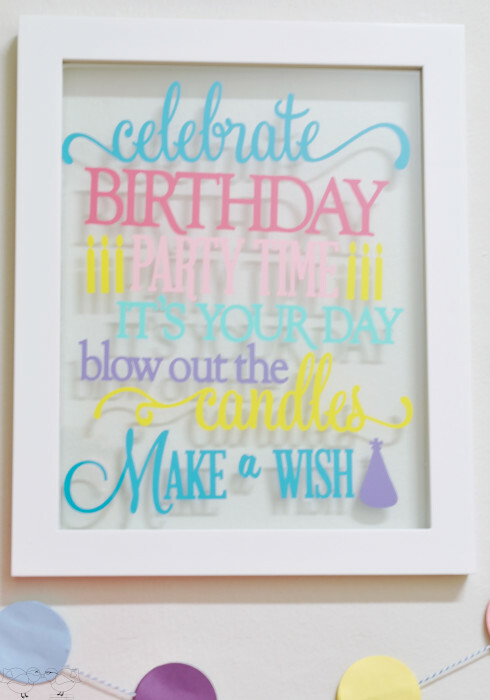 One way a crafter celebrates is by decorating, of course, and today I am sharing the few birthday decorations I made for the week. Birthday Candle Vase: As my regulars know, I redecorate the same vase every season with a new design. 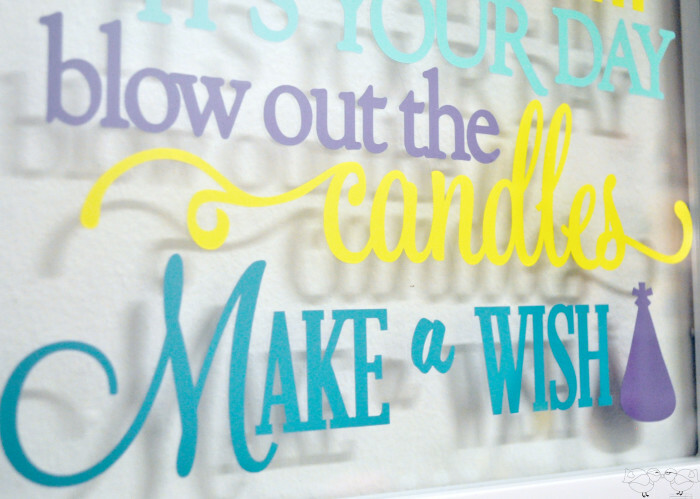 I use vinyl which allows me to easily remove the design when I am ready. For our birthdays, I used a birthday candle design from Silhouette. The design was in a square, so I cut the square out for the size of the vase and weeded out the candles. I used bright pink vinyl because I wanted a lot of color. 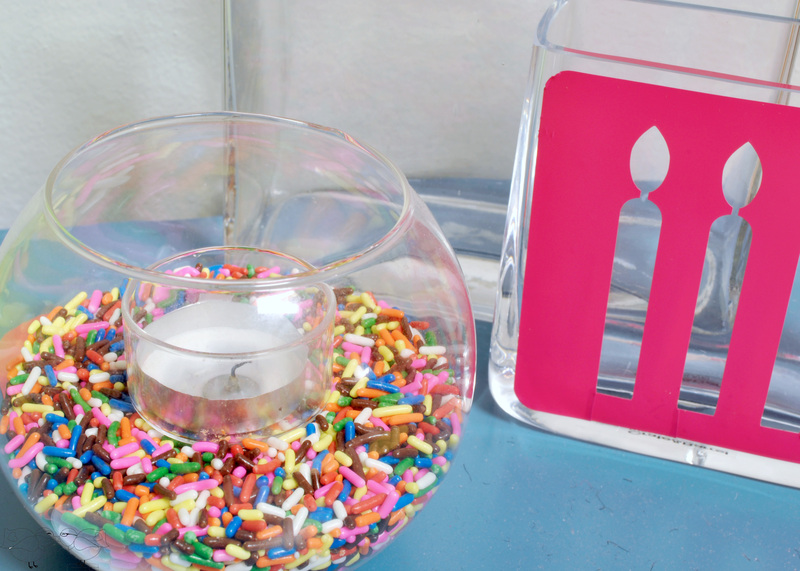 Sprinkle Candle Holder: I am using a lot of sprinkles for this birthday with the Chocolate Dipped Sprinkle Marshmallows and other yummy treats to come, so I also wanted to incorporate sprinkles into my birthday decorations. I have a glass candle holder that keeps a tea light elevated, allowing me to fill the bowl with fun things. I used a funnel to pour the sprinkles in to avoid the tea light holder. Obviously you could fill a bowl and just rest a tea light on top of the sprinkles. I love how festive and colorful it looks! You will also see a couple Washi Tape Tea Lights sitting on the table, too, for more color. Sprinkle Garland: I wanted more color on the wall and wanted to try to incorporate more of the “sprinkle” idea, so I went with a more general concept. 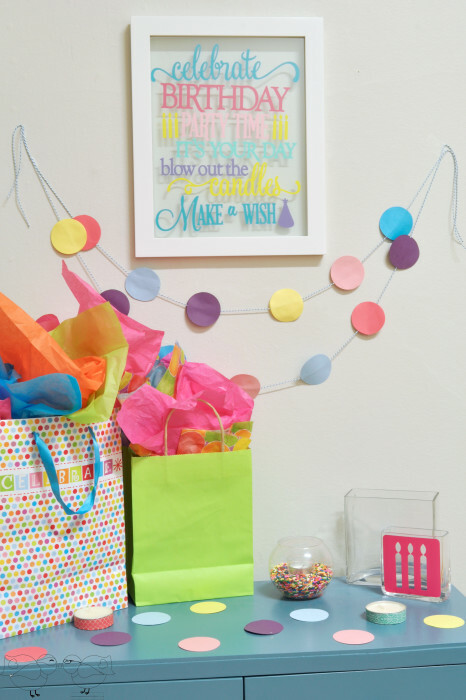 I cut out about 2″ circles of scrapbook papers in the desired colors. For each circle on the garland, you need two paper circles. Once the circles were cut out, I laid out bakers twine and spaced the circles out where I wanted them. Then, I put glue on the bottom layer of the circle, placed the Baker’s Twine on top, and put the top layer of the circle on top. Press down together for a minute to secure everything together. I then used extra circles on the table. Birthday Subway Art: I had an extra frame sitting around, so I made a colorful subway art frame for our birthday decorations. Plus, I love working with vinyl! First, I designed the frame on my Silhouette. After I knew how many lines I was going to have, I looked through my vinyl and picked out my colors. Then, I cut out the words row by row in the desired color. I did a rough placement on the glass to make sure everything fit correctly, but I decided to add the words row by row to the glass. I am so happy with how this turned out and will definitely be hanging it every year for birthdays.